Pepsi Max are a drink I really enjoy. I don’t really drink any other soft drinks but I do tend to have a few of these during the week. I like them as a bit of an afternoon pick me up, but I realize that they do contain artificial sweeteners and so I try to limit them. Pepsi Max is a good drink to have as a sweet fizzy option at Christmas time and at holiday time. I like the handy and easy to hold cans. Pepsi Max can is okay to drink but l still prefer Coke as it is as not as sweet.I don’t drink alot of soft drink but when l do my option would be Coke! 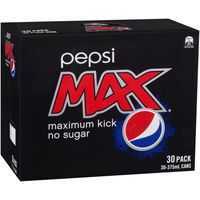 Pepsi Max is my diet drink of choice over the other diet colas as I like the sweetness, and has less of an artificial sweetener taste than other leading brands. Wow, Pepsi max is so terrible, that I still remember how bad the taste is after ten years or more. It made me fart heaps too. How would you rate Pepsi Max Can?